On Saturday morning I found myself up before first light driving toward Cambria County, Pennsylvania to fly fish Chest Creek for the first time. It took just over three hours to make it to the small town of Patton. As my GPS signaled I was getting closer to my final destination, I noticed the amount of snow on the ground was more than what I’d encountered just south along Rt. 22 near Gallitzin. The evening before when I’d researched Chest Creek, it hadn’t occurred to me that the overnight temperatures in Cambria County had been consistently low enough that creeks might freeze over. Sure enough, as I descended a long road down toward the creek, I could see that Chest Creek was frozen. I arrived at a bridge and got out to look at the water. Ice on both banks of the creek had reduced Chest Creek to a small channel of water that winded its way through snow-covered ice downstream. From what I could see, some areas upstream were entirely frozen over. I pulled my truck into a snow covered parking spot and decided I’d hike upstream to see if by some stroke of luck I might find open water that no one knew about. After pulling on my waders and rigging up my fly rod I slid down to the creek bank in the snow and tried drifting a double nymph rig in the small channel that cut through the ice. No luck. I figured the trout were tucked under the ice in deep pockets of water. A hundred yards upstream I was shocked to hook into a rainbow trout. I pulled out my net to land it and up out of the water came my nymphs. I watched my first Chest Creek trout disappear into the winter water. Another 50 yards upstream I found the creek was entirely frozen over for as far as I could see. I decided I was fighting a losing battle. I climbed out of the creek and walked the railroad tracks back to my truck. It took me fifteen minutes to find cell coverage after leaving Chest Creek, and once I did, I reassessed my situation and did a little research online. I decided to head over to eastern Blair County and explore Piney and Clover Creek for the first time. The only concern I had was that there is little to no information published online about these two streams. I’m sure some folks want to keep it this way, but for someone wanting to explore, it is frustrating. I drove to Clover Creek first and attempted to access the creek at the highway bridge on Rt. 2013. There were no signs on the stream and no clear place to park. It appeared a majority of the creek flows through private property. I didn’t see any "no parking" signs at the end of a stone road that intersected Rt. 2013 so I parked and hiked down to the creek with my fly rod. Clover Creek dumps into the Frankstown Branch of the Juniata River about 50 yards downstream. 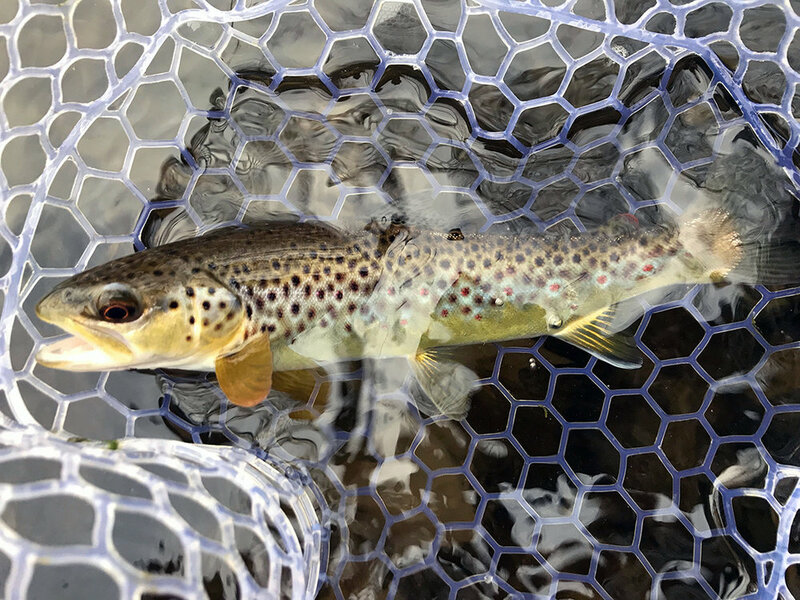 I walked to the mouth, threw some small nymphs in a few pockets but did not hook up with any wild trout. Rather than knock on doors looking for creek access, I decided to drive back west a few minutes to check out Piney Creek. There is a Lower Trail parking lot at Grannas Station and I briefly parked there to check out access to Piney Creek. There is a small trail that cuts down to the mouth of Piney at the Frankstown Branch of the Juniata River. But again, as you walk a few yards upstream, the creek appears to flow through private property. I headed back to my truck and drove up Lower Piney Creek Road. This road follows Piney Creek up through a small hollow, but all the surrounding property appeared private. There were a few houses and portions of the woods were posted with no trespassing signs. If you look on a map there are state game lands that straddle the creek but the creek doesn’t appear to ever cross into the game lands for public access. Not feeling comfortable accessing Piney Creek, I figured I needed a new game plan if I wanted to get any fishing in. If anyone reads this blog entry and has experience fishing Piney or Clover Creeks, please contact me; I’d like to chat with you. Somewhere in the gorge looking downstream on the Little Juniata River. With half my day gone, I decided to head thirty-five minutes north to fish the Little Juniata River (“Little J”). I arrived in the town of Barree around 12:30PM. It was cloudy and cold and as I drove across the Barree Road Bridge I didn’t see a soul on the water. I didn’t see any cars as I drove along Mountain Road to the lot at the end. The parking lot was empty and I looked forward to taking advantage of the lack of fishermen in the area. I pulled my waders on for a third time and rigged up my 9’-5wt Scott G2 with a 9’-5X leader. I tied on a tan Hare’s Ear Nymph as my lead fly and dropped a #20 Black Zebra Midge off the hook bend. I started the long walk back the trail that follows the creek and eventually heads up the western edge of the mountain. I walked a good distance, not all the way to the confluence with Spruce Creek, but a good ways. A classic scene on the Little Juniata River. Once I got on the water, I started drifting nymphs and working my way back downstream toward the first railroad bridge. It was cold with the air temperatures hovering around 42° and the water temperatures not far behind, just barely hitting 40°. I put a lot of drifts through many good-looking runs and riffles. I could not move a fish. It wasn’t until later in the afternoon as I got close to the second of the two railroad bridges that across the creek I finally hooked into a wild brown trout. It took me by surprise as it grabbed my midge nymph. It was great to feel the tug of that fish on the Scott. The first wild brown trout I caught on the "Little J" on Sunday afternoon. Another fat wild brownie I landed. Several casts later I hooked into another trout below the bridge abutment. Within 15 minutes I went from no fish to four fish. It was incredible and the third fish I caught was a real beauty. I felt fortunate to stand in the creek and release that fish back into the current. I didn’t see another person all afternoon on the Little Juniata. It was just me and the constant flow of train traffic on the Little Juniata railway. The buttery wild brown trout I caught on a #20 Black Zebra Midge. As daylight faded, I walked along the east side of the creek along the trail watching a freight train move parallel to me. I was asking myself what it must feel like to start a company that ends up growing so big that your name appears on the side of a hundred truck trailers stacked on a train moving through the Pennsylvania mountains. The sound of the train cars rolling along the track faded into the distance and I could hear the sound of the train horn faint in the distance.